Give your porch, veranda or deck that professionally finished look. With these woodworking plans you can add the finishing touches to your project with deck skirt boards, a drip rail and lattice panels. The screened lattice panels prevent wasps and other insects from nesting under your deck. And the attached heavy duty landscape fabric will keep the weeds from taking over. — all in a 17-page printable PDF file that you won't find anywhere else. 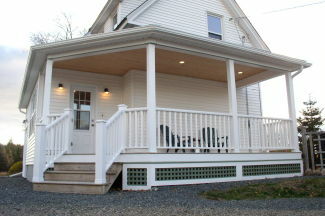 How to Build Porch Skirting, Soffits & Fascias plans are a companion to our "How to Build Traditional Porch Railings" (#SHE-1101) and "Build No-sag Gates for your Porch or Deck" (#SHE-1102) woodworking plans. These woodworking plans are suitable for any DIY'er with intermediate woodworking tools and skills. Stonehaven products are for your personal, non-commercial use only. For other licensing arrangements, please contact us through our website: http://stonehavenlife.com.